The popular notion that riding a bicycle throughout Florida could be one helluva way to see the Sunshine State can be traced to Herb Hiller, a string bean-thin 85-year-old who nearly 60 years ago moved to Florida and began exploring its back roads for old villages and beautiful natural settings. While Florida earned a reputation for being a theme park, beach and Disney destination, Herb began selling bicyclists on discovering a different Florida -- one dominated by beautiful hemlocks and soaring birds and small towns and beautiful rivers. It turned out that Herb emerged as the Godfather of Florida's bicycle tourism, lending his vast experience of pedaling the state's back roads to many bicycle, greenway and trail organizations during the past six decades. Even at 85, Herb remains active and is advancing trail projects. He's president of the St. John's River-to-Sea Loop Alliance. It's the longest multi-use trail underway through the American Southeast. Check out the map of this loop trail. It would extend from St. Augustine at the trail's north end to Titusville on the trail's south end in Brevard County. The former travel writer now lives in DeLand, the Volusia County government seat between Orlando and Daytona Beach off I-4. What a treat it was to see Herb on Wednesday evening at a bike tour dinner hosted be fellow bike tour guide Bubba Barron of Bubba's Pampered Pedalers in Cocoa Beach. When you chat with Herb, it's like listening to a savvy veteran bicyclist who is part naturalist, part historian and part tourism expert. There's Bubba in the center and Herb is looking spry in a red turtleneck. 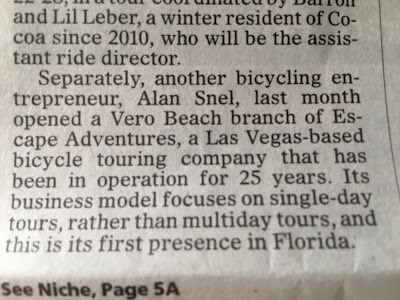 I want to thank Bubba for calling me after both of our bicycle tour businesses appeared in a Florida Today front page story nearly two weeks ago. 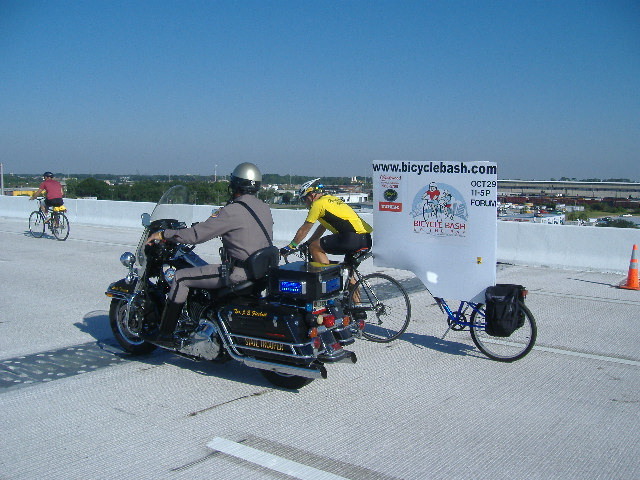 Bubba's Space Cost bike tours are week-long, while Escape Adventures' Florida tours are day tours. Bubba, a former St. Louis police detective, invited me to his dinner and I loved meeting him and Herb. Before this week, I hadn't talked with Herb in more than 20 years when I interviewed the bicycle touring legend for a story I reported for the Palm Beach Post on biking the Lake Okeechobee Scenic Trail. Herb talked to more than 30 of Bubba's week-long tour cyclists at a dinner and I enjoyed listening to the bike ecotourism master explain how former Florida Gov. Bob Graham appointed Mr. Walkability and Bicyclability, Dan Burden, as the state's first bicycle coordinator in 1980. Herb said some state DOT road engineers thought they'd eat Burden for lunch. 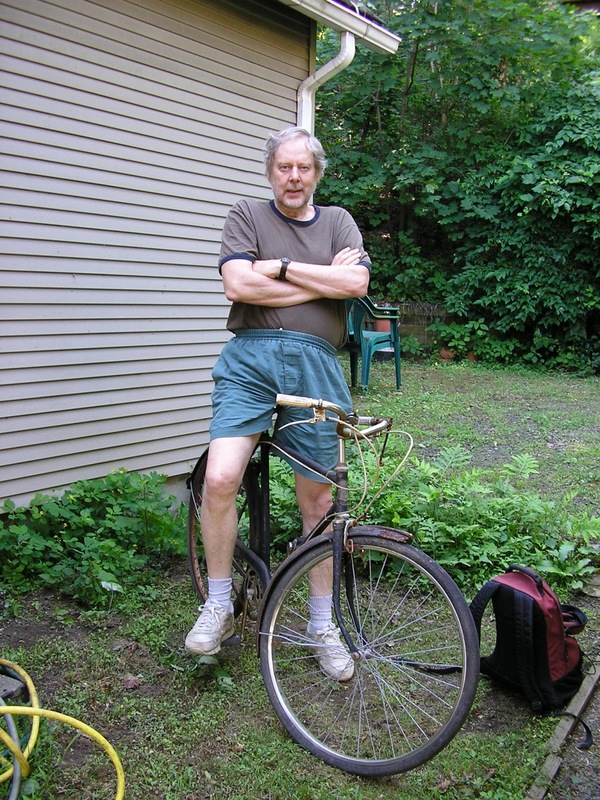 "It was Dan who ate the road engineers," Herb told the touring bicyclists. 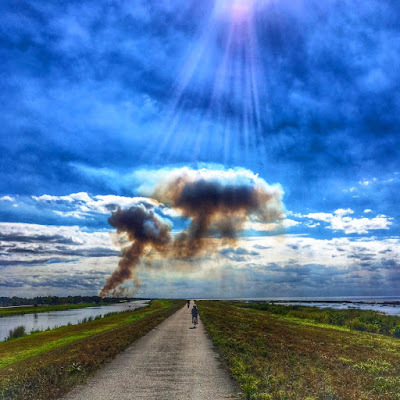 I like to think that Escape Adventures' bike tours around Florida -- from Lake Okeechobee to Jungle Trail along the Indian River lagoon to the Withlacoochee Trail -- follow Herb's bike tourism model of celebrating Florida's natural wonders. 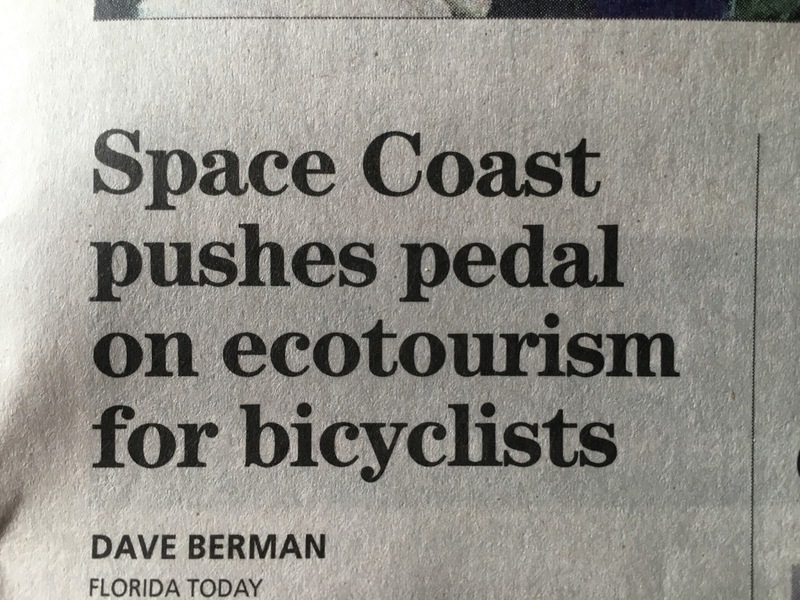 The Tampa Bay Times certainly took notice of Escape Adventures' remarkable bike tours with a section cover story on the EA Florida tours. Herb Hiller's bike touring handiwork still is literally felt today. On a late Saturday afternoon at Sebastian Inlet Surf & Sport, Bob Spiegelman and Paul Haydt of the East Coast Greenway Alliance met about 30 local bicyclists to chat about their 3,000-mile-long greenway trail from Maine to Key West. Spiegelman, who lives in Concord, New Hampshire, is the chairman of the greenway alliance's voard of trustees, while Haydt is chairman of the Florida committee and will try to knit together a 560-mile segment of the East Coast Greenway in Florida that will end in Key West. I couldn't help but think that Herb could have offered a few words of advice this afternoon and I'm pretty sure the greenway alliance has already reached out for sage counsel from the Godfather of Florida bicycle tourism. 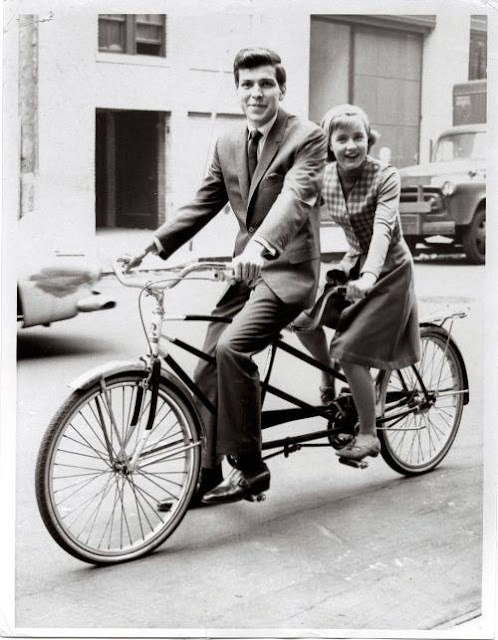 Frank Sinatra Jr and Patty Duke -- Patty looks much happier than Frank Jr., who looks as if someone just told him he would have to wear a helmet on his lovely coiffed locks. LeBron James is one big dude and I'm guessing he could use a bike that's a tad bigger. This is close to home. That's my dad, Julius Snel, pedaling to his daily tennis game. That's the official tennis shorts of Century Village. Julius has an exclusive sponsorship deal with adidas. When you ride a bicycle, you never know what type of wildlife you might meet. 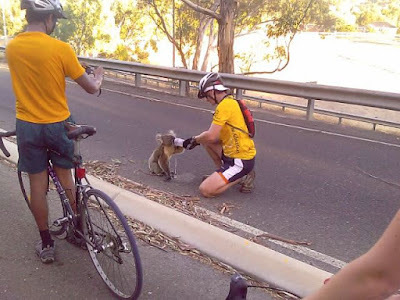 Like these bicyclists providing a drink to a koala bear. I think the bicycle elliptical device has come a long way. I always thought it would be cool for the public government agency that oversees the raised highway in Tampa to pick at least one Sunday morning a year to allow bicyclists to ride on the top tier and enjoy the views around Tampa. There was one man who was able to convince that agency to do it -- the most powerful, influential person in Tampa, Richard Gonzmart. In 2006, Richard, who owns a restaurant empire in Tampa that includes the famed Columbia Restaurant in Yboy City, convinced something called the Tampa Hillsborough Expressway Authority to allow bicyclists to ride on the top level of the Selmon Expressway for a fundraiser to raise money for a young woman battling cancer. I certainly donated my dollars for this cause and joyfully pedalled with the Bicycle Bash advertising board. 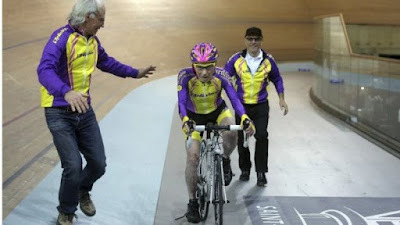 I believe my long time bicycle pal, Ellen Pierson, snapped this photo. This "Little Man" ain't so little anymore. That's Connor, son of my friends, Barry and Vicki, back in the day when they lived in northwest Denver and Little Man ice cream brought more people to its small hut than a John Elway cameo. That's Wayne Hall, a master journalist of the Hudson Valley north of New York City better known as "Sir Wayne of Raleigh." I believe that's a Raleigh bicycle. Wayne was the supreme zenmaster of journalism in my formative years and was the premier environmental writer of New York state. He sure knew a lot about the outdoors and could write about it in the most lovely way. It's a St. Petersburg spring rite -- sporty little open-wheel race cars that zoom around downtown between concrete barriers but every now and then a tadpole recumbent hits the course and shows how you scorch the track. 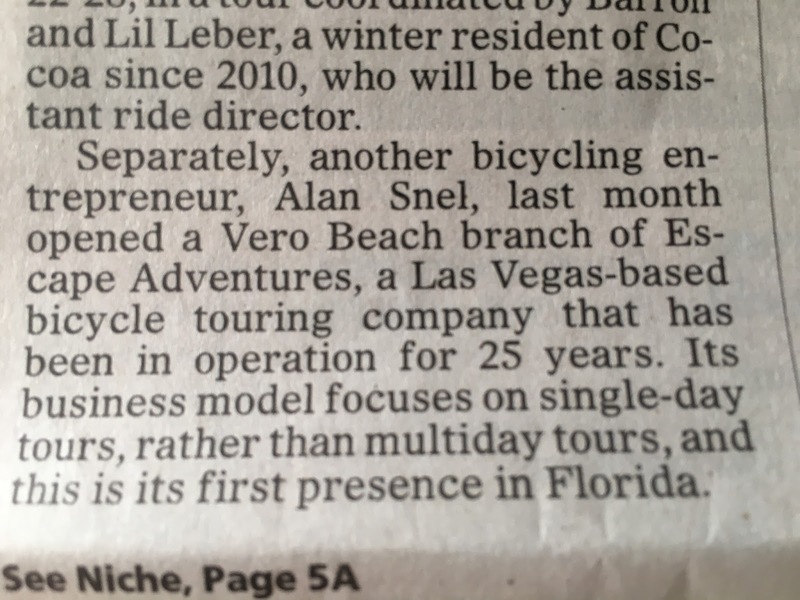 Tampa Bay Times features writer Sharon Wynne wrote a tremendous story on Escape Adventures' new Florida bicycle tours. I enjoyed taking Sharon out on the Pinellas Trail to show her one of the seven different designated bike tours that Escape Adventures will offer. The Escape rides are a beautiful array of biking opportunities in Florida, fromthe Lake Okeechobee Scenic Trail (below) to the Atlantic Ocean on A1A in Vero Beach between the Sebastian and Fort Pierce Inlets. The rides include comfortable shuttle service and high-level rental bikes, such as the Specialized bikes here being pedaled by two bikers on Jungle Trail. Thank you Jeff Houck and others for sharing this Times story. Jeff Houck with Grace Muehlnickel Houck and Alan Snel. 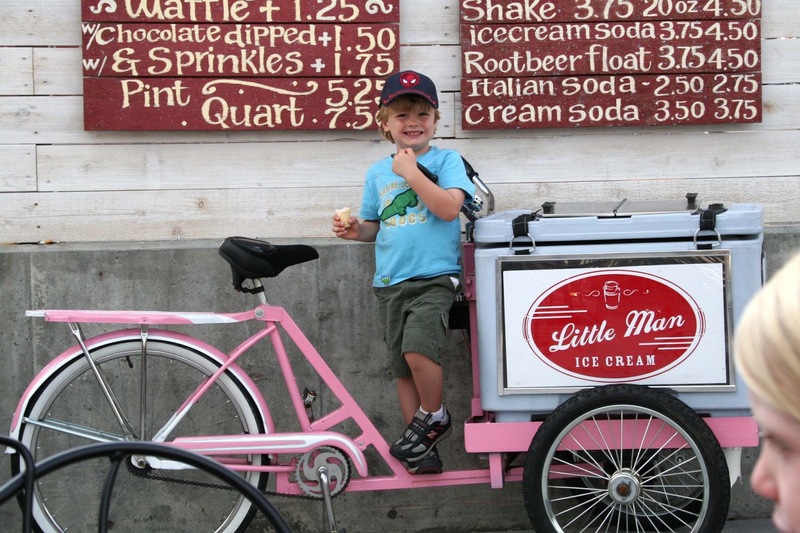 "These are my favorite bike rides that I've cherry-picked from years in Florida." If anyone knows the juiciest morsels of Florida from a bike, it's my buddy Alan. Book your ride today! Pinellas County is Florida's most densely-populated county, but you would never know it if you joined Escape Adventures for its Florida Pinellas Trail tour. Cathy, Ray, Neil and Steve enjoyed pedaling a chunk of the 47-mile-long paved trail, which runs from the St. Petersburg waterfront all the way north to Tarpon Springs in north Pinellas County. It's a lovely swath of pavement. following an old railroad track easement and slicing through many Pinellas cities and various settings, ranging from parks and tree-canopied sections to even circumventing shopping centers and some industrial sections in the St. Pete city area. For this ride, we focused on a segment in the Clearwater and Dunedin area. Dunedin is a big pit stop on the trail, which opened in 1990 and was funded with a Penny for Pinellas tax and state and federal funds. Cathy, Ray and Steve are all local Pinellas residents, and they loved the new Escape Adventures bicycles -- aluminum road bikes with extra wide tires for stable pedaling. The trail has infused Dunedin with a prolonged burst of tourism and visitors -- and we added to the local economy with a lunch stop at Kelly's restaurant at 319 Main Street. Downtown was facing economic hardships in the 1980s, but when the Pinellas Trail opened 27 years ago it brought tourists and visitors. Dunedin's Main Street now benefits from the pedaling visitors who eat, drink and buy souvenirs in its businesses thanks to the Pinellas Trail. Here's our Escape Adventures bike crew from Tuesday. Book a tour at Escape Adventures Florida. 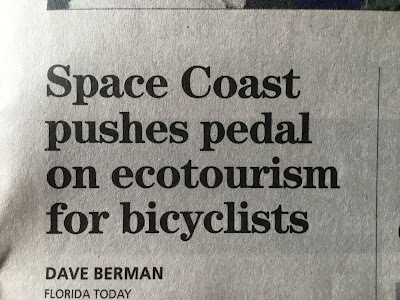 Escape Adventures' new Florida bicycle tours made Florida Today's front page today when business writer Dave Berman did a cool story on bicycle ecotourism. Florida's lush landscape and local scenes are best viewed from the seat of a bicycle because the bike gives you the chance to cover some turf while being close enough to see, hear, smell and feel Florida's nature. The Escape Adventures Florida tours cost $189, which includes shuttle service from your hotel to one of seven beautiful day tours around the state and then back to your hotel; using a new Specialized bicycle that is a road bike style with wider tires for a nice stable ride; and snacks and water for the ride. Leiba and her husband Leibel bicycled the trail above Lake Okeechobee to feel the serenity of the blue vastness, a glassy watery surface that twinkled this ultra-sunny afternoon in western Martin County. The couple took this Escape Adventures bicycle tour bike tour of The Big Lake to escape the busy urban sprawl of their North Miami Beach neighborhood and bathe in the splendor of one of America's biggest freshwater lakes. Joe from West Palm Beach also joined the Lake Okeechobee ride, a pedaling experience along the elevated dike trail that overlooks the mighty lake. We made a fun pit stop at the famed J&S Fish Camp, where we bikers joined the bikers of the motorized type to grab a rest and a swig of water. J&S is a landmark on the lake, where bikers, fishermen and tourists grab a Bud Lite, laugh at the funny gator gear and soak up life outside the big city. Leiba especially enjoyed the stuffed bobcat, part of the wildlife that calls Lake Okeechobee home, along with a stunning array of water birds such as great blue herons. 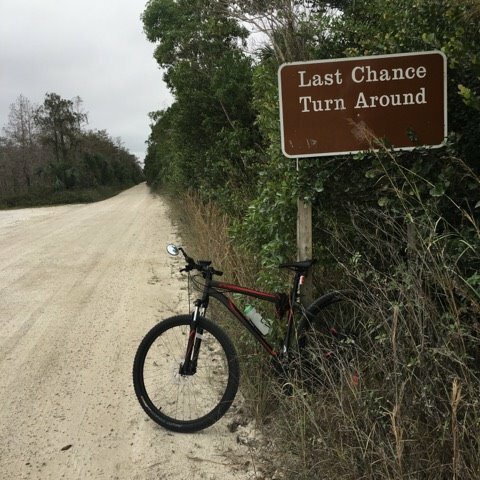 But Florida's chilly conditions didn't bother Escape Adventures tour bicyclists Anne, Mike and Shirlee who enjoyed a ride along Jungle Trail, a hard-packed dirt road on the Vero Beach barrier island that runs along the Indian River Lagoon in South Florida. The trio pedaled on Jungle Trail to reach one of Florida's most underrated natural gems -- Pelican Island National Wildlife Refuge. The preserve is the country's first national wildlife safe haven created in 1903 to save the beautiful water birds being killed by hunters for their feathers that were used for women's hats at the time. We pedaled to the national preserve and then walked along a new boardwalk that led to a perch to see Pelican Island, a spit of land in the Indian River where birds flock to right before sunset. It was all quiet on this late Sunday morning, so we didn't see any great blue herons, snowy egrets or brown pelicans winging it to Pelican Island. The island is such a prominent local attraction that the local chamber of commerce in Sebastian has a camera mounted to the end of the boardwalk with its lens focused on Pelican Island for live streaming back to the chamber building on the mainland across the lagoon. So, we posed for a photo at the setting, with the Indian River and island in the backdrop. Escape Adventures bikers pedal brand new Specialized bicycles -- road bikes with extra wide tires that offer smooth and stable rides Disc brakes provide excellent slowing and stopping powers. 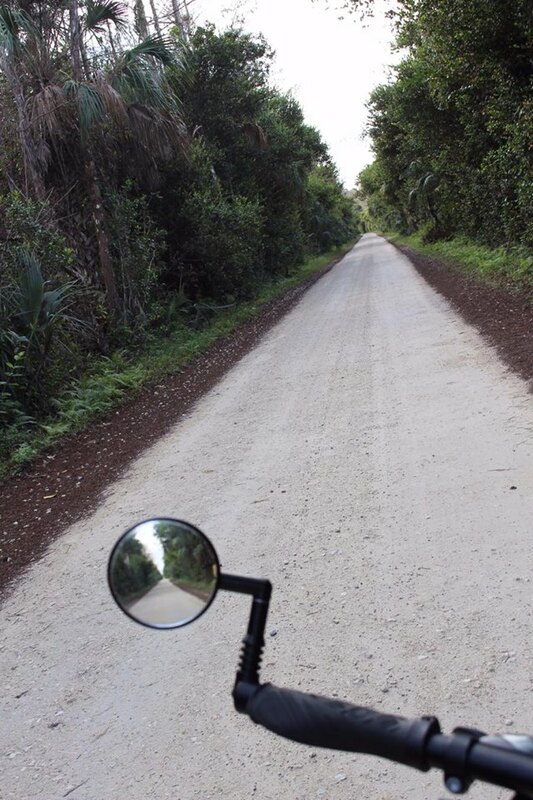 The bike tires were wide enough to handle the Jungle Trail dirt surface, which is packed and paved by the Indian River County public works crews. The Jungle Trail is also a road back to history. The southern end of the road offers a view of the old Jones dock, where Indian River County's famed oranges and grapefruits were shipped along the Indian River for transport around the country back in the day. During this stretch, Jungle Trail hugs the Indian River and makes for a lovely and tranquil biking setting. Florida is the place to bike right now. So log onto www.escapeadventures.com and click on our Florida page to see our bike rides. I can also tailor make a bike tour for you and your group as well in Florida. Joe Capozzi's video went viral last week when he stopped on a bicycle ride and videotaped a colossal war to the death between a massive python and an alligator in a Big Cypress swamp in South Florida. South Florida TV news shows covered Joe's video and I caught up with my good friend who works for the Palm Beach Post to ask him what role the bicycle played in scoring his amazing video. Here's Joe Capozzi in his own words explaining how a bicycle delivered him a memory that will last a lifetime. If I had driven down that stretch of Loop Road in my car, I would have seen dozens of alligators sunning themselves on the side of the road. head and missing — that prompted me to slow my bike and look into 15 feet the swamp at the reptile rumble in the jungle. You see so much that you would otherwise not see from the inside of a car. Most weekends I attach my trusty black Specialized mountain bike to the back of my old Honda Civic and drive to the many beautiful places that make up South Florida. Once I arrive, I leave the car parked and locked. The real adventure starts when I pedal away on my bike. colors on the trees and flowers on back roads that take you right to the water in Key West, the breathtaking changes in the color of the sky as the sun sets over the cypress in the Loxahatchee National Wildlife Refuge. The ability to pedal so deep into the wildness that turkey vultures follow overhead, stopping in the branches above you when you stop. On the morning of Dec. 21, I parked on Loop Road, about 2 miles south of Tamiami Trail in Big Cypress, and continued my journey on the bike. About 5 miles later I heard the splashing and skidded to a stop to witness the python-gator fight. I watched for about 15 minutes and I remember looking up and down Loop Road a few times, amazed that it was empty that I was all alone, the only spectator with a ringside seat to something wildlife officials would later tell me is rarely witnessed in the wild. 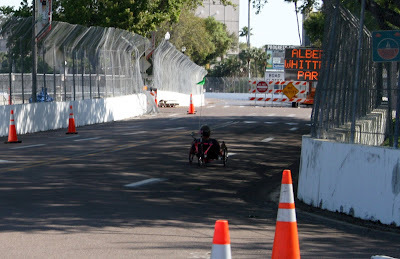 Later that morning, I was passed by a few cars. Most of them were going slow but never stopped. The few cars that did stop did so after seeing me, standing up and straddling my bike, aiming my camera into the swamp at an alligator floating on the surface. “See anything good?” one man asked after rolling down the window of his SVU. It turns out Arnold is just like the rest of us. 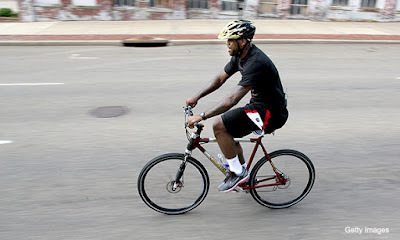 He's not going to let some dumb leg fracture keep him off his bicycle. The Terminator Man was pedaling around Venice Beach a few days ago -- just the right place for this muscleman. 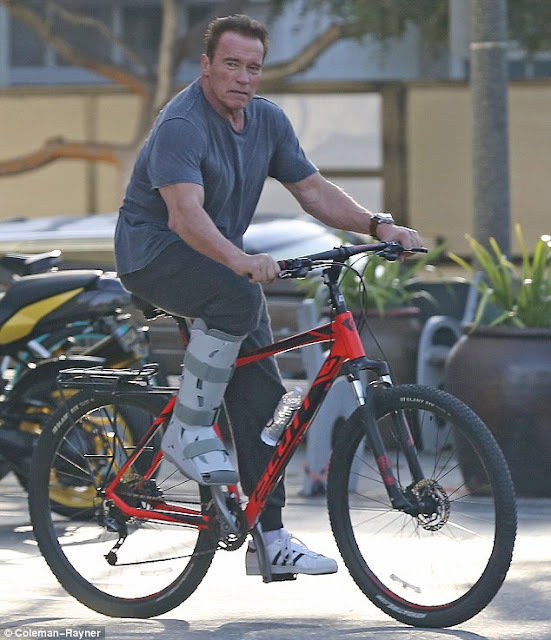 Fun story posted by the Daily Mail talks all about Arnold and the former California governor bicycling with his giant walking boot. My friend Joe Capozzi's video is on fire lately. People can't get enough of watching a Burmese Python squeeze the life out of an alligator in a swamp in Big Cypress -- a scene that Joe captured on video while riding his bicycle on the preserve's Loop Road. I love this story because Joe -- a Palm Beach Post reporter who I know for more than 20 years -- used an essential tool to get into position to witness this tropical ballet between two top-tier oldtime predators. When you're pedaling the bicycle, the mode of transportation moves at just the right speed to detect life all around you while moving fast enough to cover a lot of ground. Even here in Vero Beach, I have uncovered several business stories to report while pedaling on roads by checking out real estate signs and setting up real estate stories. There are so many great things about bicycling -- from enhancing mental and physical health to being a great form of transportation. Bicycling also got a nice mention in this story posted on the Las Vegas Sun web site about the First Couple of Las Vegas -- Oscar and Carolyn Goodman. The reporter uses an anecdotal lede about the new mobile bike renting program in Las Vegas (known commonly as bike share) that started a few months ago to kick off a story about the Goodmans still doing their thing in Sin City. It could have happened to any one of us. A bicyclist in Weston was cycling in a bike lane in that west Broward County, Fla community on an early Sunday morning when a person drove his or her car into a cyclist and killed him. Christopher Mohr did that day and the driver fled from the hit-and-run. More than 200 cyclists pedaled this past week in a memorial bike ride to remember the fallen bicyclist. Someone is celebrating a birthday in 2017. The bicycle -- or its kinda early form of it -- is turning 200 years old and Mannheim, Germany is throwing a birthday bash. Just a friendly reminder to buy a strong lock and secure your bike because here's yet another story about bicycle thefts. This time, it's about the increase of bikes being stolen on the University of Washington campus in Seattle. I've had my fair share of bikes stolen -- my last bike that was ripped off was locked at the UNLV campus even though I used a sturdy cable lock. But with bolt cutters, cables are easily snapped and bicycles taken. Colorado State student Matt Carnal is raising money for a little bike ride -- a 5,700-mile jaunt across Russis starting in July. The Red Bull-Trans Siberia Extreme race requires a $20,000 entry fee and Carnal is trying to raise $10,000 by the end of the month. Carnal is a long-distance bicycling maven, a pedaling marathon man who biked a fixie across the country's southern tier. And we end with this young fella. The old girl doesn't walk much anymore. Pugsy's rear legs are plagued by arthritis and her lower back droops low, making it appear as if this 17-year-old pug walks like a raccoon. But tonight just before sunset at the spacious Vero Beach dog park off the Indian River Lagoon, Pugsy strolled around the grassy field. She wobbled a bit, but still was getting around. I thought it was a scene out of "Awakenings" and the drug in this case was Merrick's canned food of Grammy's Chicken Pot Pie. The dog park has re-invigorated the Furry Zenmaster. Pugsy used to take 15-minute walks about two years ago, but she has been going downhill in the walking department. "Other days Pugsy would just stand there but today she's walking all over the place," observed a woman with long gray hair who owns a basset hound. "Must be that chicken pot pie." Pugsy even began walking to strangers, like this gentleman who came to the park with four dogs. Another older gentleman who came with his white terrier was amazed at Pugsy. "She's like those people who decided to work out for their New Year's resolution. She;s going to the gym now," he joked. 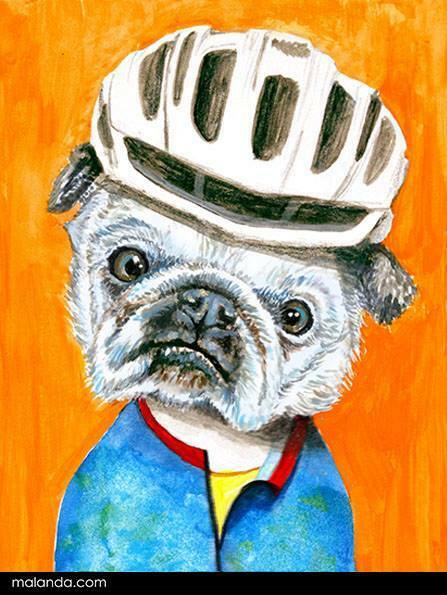 I know Pugsy won't be around for much longer. But she's living her life the best she can right until the end. And that's all I can hope for. It's Florida's Third Coast -- the Lake Okeechobee shoreline. And it makes for wonderful bicycling. On Saturday I followed the Lake Okeechobee Scenic Trail from Okeechobee to Port Mayaca and back for a lovely 46-mile bike ride. It's a fabulous ride with no cars and lots of soaring birds, from Great Blue Herons to ospreys. Readers of this blog might know that I do an annual one-day, 120-mile bike ride around the lake in November to celebrate the end of summer in Florida and this was the first time I did a single chunk of the ride. The trail atop the earthen dike that surrounds The Big Lake is paved in only two long sections. But one of the long sections on the south end of the lake is closed because the US Army Corps is fixing breaches in the earthen berm that was built to stop the lake water from wiping out the neighboring cities when hurricanes struck. It's a taste of old Florida and the serenity and beauty are not as dramatic as mountain terrain. But it's just as inspiring.